Clockers is a 1995 American crime drama film directed by Spike Lee. It is an adaptation of the 1992 novel of the same name by Richard Price, who also co-wrote the screenplay with Lee. The film stars Harvey Keitel, John Turturro, Delroy Lindo, and Mekhi Phifer in his debut film role. Set in New York City, Clockers tells the story of Strike (Phifer), a street-level drug dealer who becomes entangled in a murder investigation. The film originally entered production with Martin Scorsese attached to direct; he had previously collaborated with Price on his 1986 film The Color of Money. Scorsese eventually dropped out of production to focus on his passion project Casino, at which point Lee stepped in to direct and rewrite the script, Scorsese remained a co-producer alongside Lee. 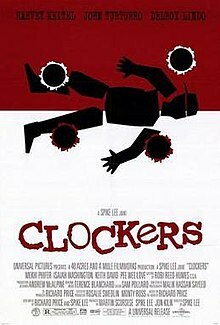 Clockers received generally positive reviews from film critics, but was a disappointment at the box office, grossing only around $13 million on a $25 million budget. In a Brooklyn housing project, a group of clockers — street-level drug dealers — sell drugs for Rodney Little (Delroy Lindo), a local drug lord. Rodney tells Ronald "Strike" Dunham (Mekhi Phifer), one of his lead clockers, that another dealer, Darryl Adams (Steve White), is stealing from him and Little wants Strike to kill Darryl Adams. Strike then meets with his brother, Victor Dunham (Isaiah Washington) and tries to persuade Victor to kill Darryl Adams. Rocco Klein (Harvey Keitel) and Larry Mazilli (John Turturro), homicide detectives, ride to the scene of Darryl Adams' murder. Larry and Rocco receive a phone call from another detective who says a man has confessed at a local church that he killed Darryl. The police meet Strike's older brother Victor at the church and take him in for questioning. In the interrogation room, Victor tells Rocco that he shot Darryl Adams in self-defense. Rocco finds holes in this story and starts looking into Victor's background which includes two jobs, a wife, two children, no criminal record, and aspirations to move out of the projects; Rocco comes to the conclusion that Victor is covering for his younger brother. Rodney accosts Strike for not killing Darryl Adams, with Errol Barnes (Thomas Jefferson Byrd), Rodney Little's enforcer, chastising Strike for getting Victor to do it. Later, Rodney Little tells Strike a story of a younger Rodney and an younger Errol (which goes to a flashback), where Errol threatened Rodney at gunpoint to kill a dealer. Rodney kills the dealer, and (back to Rodney and Strike) Rodney Little tells Strike the reason Errol forced him at gunpoint to do it was so that Errol Barnes could hold something over Rodney Little, if he ever decided to tell on him, which was why he told Strike to kill Darryl Adams. Rocco pressures Strike but Victor sticks to his story, so Rocco convinces Rodney that Strike has confessed and informed on Rodney's drug ring. Rocco arrests Rodney and then implicates Strike in front of his crew. Strike tries to play it off and deny that he was involved in Rodney's arrest, and his crew begins to turn on Strike, leading to the crew labeling Strike a snitch. Rodney calls Errol, advises that he is in jail and Rodney puts a hit out on Strike. Strike gets together some money and decides to leave town. As Strike walks to his car, he sees Errol sitting on his car, deducting that Errol is there to kill him. Strike hides behind a fence, but a younger boy who admired Strike, Tyrone (Pee Wee Love), rides up to Errol on a bike and shoots him dead with Strike's gun. Later, Tyrone is taken into custody. With Rocco, Tyrone's mother (Regina Taylor) and Andre (Keith David) listening, Tyrone confesses that he got the gun from Strike. Andre storms out of the interrogation room, and proceeds to look for Strike. Andre angrily beats Strike in front of the whole project, and threatens the onlooking bystanders with a gun to stay back. Andre threatens to kill Strike if he ever talk to or even looks at the young boy again. As Andre says this to Strike, Rodney pulls up, which leads to Strike jumping in his own car and driving to the precinct, with Rodney following. Strike runs into Rocco (who now has an arrest warrant for Strike), and runs into the precinct as Rodney pulls up. Rocco tries to intimidate Strike into confessing to the murder, and Rocco loses his composure when Strike continues to change his story. When Rocco grabs Strike and throws him against the wall, Strike's mother walks in with Mazzilli and Victor's wife (Lisa Arrindell Anderson). She advises Rocco that Victor confessed to the murder immediately when he got home, and how Victor was physically unable to leave his bed. Strike asks his mom what happened to the bail money he gave Victor's wife, which leads to Strike's mom angrily throwing the money in Strike's face. As this is going on, Rodney proceeds to damage Strike's car (going as far as breaking the windows, damaging the doors, and urinating in the car). Left with no other options and unable to go home, Strike asks Rocco to drive him to Pennsylvania Station. As they are sitting in a car, Rocco threatens Strike that if he ever sees him again, he will arrest him, let Andre beat him down, then arrest Rodney on the same charges and he will make sure Rodney and Strike share a cell and a bed in prison. Strike boards a train and leaves town. While Tyrone is playing inside his apartment with the train set that Strike gave him, outside the apartment, Rocco and Mazzilli responds to a homicide of Scientific, one of the guys in Strike's old crew. The film ends with a shot of Strike looking outward on a moving train, alluded to be far away from the city. Critics and film buffs were quick to notice that the poster, designed by Art Sims, was similar to Saul Bass' art for Otto Preminger's 1959 film Anatomy of a Murder. Sims claimed that it was a homage, but Bass regarded it as a rip-off. The film received generally positive reviews. The review aggregator Rotten Tomatoes records that 69% of reviewers viewed it positively. Roger Ebert gave the movie three-and-a-half stars. David Denby of New York said that while the original novel was "filled with operational detail" the film adaptation was "more emotional" and "less factual". Denby further explained that Spike Lee was "concerned less with Strike's spiritual condition than with the survival of the entire community." Denby said that Lee, in the work, "jumps around a lot, telling his story in hot flashes" as typical in Spike Lee films, arguing that the technique makes the film "difficult to follow". In regard to the cinematography of Malik Sayeed, Denby said that it was "rough and dark-hued, with an almost tabloid angriness in the scenes of violence." The movie was a box office disappointment. Clockers (Original Motion Picture Soundtrack) was released on August 25, 1995 through MCA Soundtracks. Composed of twelve songs, it features performances from Marc Dorsey, Rebelz of Authority, BrooklyNytes, Buckshot LeFonque, Chaka Khan, Crooklyn Dodgers '95, Des'ree, Mega Banton, Seal and Strictly Difficult. The album made it to #54 on the Billboard Top R&B/Hip-Hop Albums chart in the United States, spawning two singles: "Return of the Crooklyn Dodgers" by Jeru the Damaja, O.C. and Chubb Rock, which peaked at #96 on the Billboard Hot 100, and "Love Me Still" by Chaka Khan. ^ Schaefer, Stephen (1995-09-08). "Poster Imposter | News". EW.com. Retrieved 2010-08-19. ^ "Clockers (1995)". Rotten Tomatoes. Retrieved 20 July 2012. ^ a b Denby, David (September 18, 1995). "Hard Time". New York. New York: New York Media, LLC. 28 (37): 72–73. ISSN 0028-7369. Retrieved May 21, 2017. ^ Dutka, Elaine (1995-09-19). "Weekend Box Office : 3 New Films Open Quietly - Los Angeles Times". Articles.latimes.com. Retrieved 2012-07-23. ^ Erlewine, Stephen Thomas. "Clockers [Original Soundtrack] - Original Soundtrack | Songs, Reviews, Credits". AllMusic. Retrieved April 23, 2019. ^ a b "Soundtrack Clockers Chart History". Top R&B/Hip-Hop Albums. Retrieved April 23, 2019.